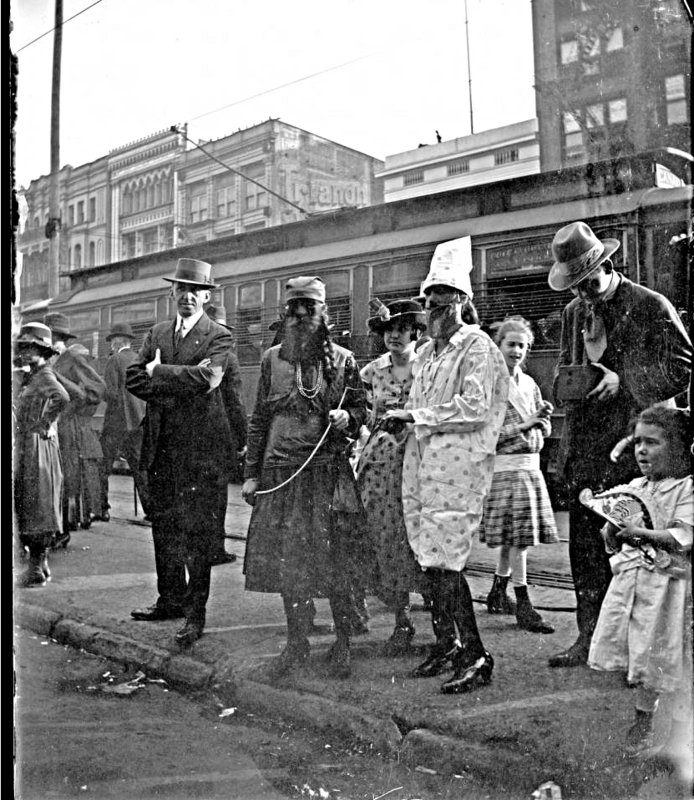 Canal Street 1918 – Armistice Day in New Orleans was a day of celebration. The Eleventh Hour of the Eleventh Day of the Eleventh Month. The End of World War I was marked with celebration in New Orleans. There’s a seven hour difference between New Orleans and Paris. So, New Orleans woke up to the end of the war. One of the first gathering points was the 900 block of Canal Street, in front of the Audubon Building, S. H. Kress, and Maison Blanche. As the news spread, people gathered on Canal Street. The worst war the world had known was over. By the afternoon, impromptu parades popped up around the city. Because New Orleans. New Orleans enjoyed an incredible growth spurt in the 1900s-1910s. The Sicilian community expanded out from the French Quarter and Treme, into Mid-City. By 1915, they established their own Catholic parish, St. Anthony of Padua, on Canal Street. The Irish and Germans continued growing in the Irish Channel. The city (well, with the exception of the African-American community) was on a roll. They city built new schools. Streetcar routes expanded. Canal Street evolved into a department store nexus. World War I in New Orleans was different from the Second World War. The war started in 1914. The United States didn’t enter the war until 1917. The commitment of the United States to the European war was quite different than twenty-five years later. The US sent an “Expeditionary Force” to Europe. While the battlefields were horrific places, the “total war” of the 1940s didn’t yet exist. So, the biggest issue for New Orleans was the closure of the Storyville District. The Southern Railway brought thousands of troops to New Orleans. They ended their journey at Canal and Basin Streets, right next to Storyville. The military commanders didn’t want their troops in brothels before boarding ships to Europe. Therefore, City Hall closed down the district, after twenty years. Canal Street 1918 was all about supporting the troops. Aside from sending the boys to the war, New Orleans didn’t play a large role in the war effort. The city’s German community fell victim to a great deal of xenophobia. Berlin Street changed to General Pershing Street, for example. New Orleans, for all of our French/Spanish/African roots, could not separate itself from its German connections, though. The Germans made it clear they were Americans first. The most important role in the war for New Orleans was buying Liberty Bonds. Financing the war effort required cash. Bonds paid the bills. Even though buying war bonds was a sacrifice, New Orleans, like the rest of the nation, stepped up. Canal Street displayed war memorials starting in 1919. The Ninth Ward’s Victory Arch was the first permanent WWI monument in the country. The arch is controversial, because the names of New Orleans’ WWI dead are segregated on the monument. Buy Edward Branley's latest novel, Trusted Talents! MP-TP Terminal 0-6-0 on the riverfront. This 0-6-0 switching engine is working the docks on the New Orleans riverfront in the late 1930s. American Locomotive Company (ALCO) built this engine in 1907. At the time of this photo, it ran on the Missouri-Pacific/Texas Pacific Terminal Railroad in New Orleans. The New Orleans Public Belt Railroad (NOPB RR) ran tracks along the waterfront at number of the wharves. While longshoremen unloaded ships carrying bananas and other perishables to warehouses, then onto trains, many cargoes went directly into railroad cars on the dock. Switch engines placed the appropriate type of cars next to the ship. So, they filled the cars and the switch engine pulled them off the dock. The railroad assembled a short trains just off the dock. They ran those trains to their yards. From there, the railroad organized longer consists to get the goods away from New Orleans. The ship in this photo was the USS West Hobomac. It was the thirteenth in a series of twenty-four cargo ships built by Skinner and Edy in Seattle, Washington. The shipyard launched West Hobomac after only sixty-six days. The ship traveled to Europe, hauling cargo during WWI. The ship made two trips before the end of the war. After WWI, the US Navy decommissioned West Hobomac. It became SS West Hobomac. The Navy transferred it to the United States Shipping Board. USSB leased the ship to several operators. Lykes Steamship operated the ship from 1933 until the beginning of World War II. Lykes had extensive operations in New Orleans. So, it’s logical that SS West Hobomac visited the city regularly. This photo is part of a WPA collection, which dates it at 1939-1940. TP-MPT #2 is now owned by the Louisiana Steam Train Association. The Trinity and Brazos Valley ordered this engine from Alco in 1907. Alco built delivered it from their Richmond Works. T&BV assigned it #76. T&BV went bankrupt in 1914, and Barry Equipment acquired it in 1917. Barry sold #76 to TP-MPT. That railroad renumbered the engine to #2. After TP-MPT folded, Bisso Towboat bought the engine. The engine remained with that company for over thirty years. The Louisiana Steam Train Association now owns this engine. Thanks to Tony Howe and Gregory Beadle for info on the 0-6-0. Buy NOLA History Guy a Coffee! 1940s postcard promoting the KCS Southern Belle. The train left Kansas City for its final run on November 3, 1969. Kansas City Southern passenger service operated out of the The Louisiana and Arkansas-Kansas City Southern station. The station opened in 1923, at 705 St. Rampart Street. Kansas City Southern acquired Louisiana and Arkansas in 1939. This motivated the railroad to operate New Orleans-KC service. The city opened Union Passenger Terminal in 1954. So, the train operated from there. The original station became a NOFD fire station. The city demolished it in the 1960s. The 700 block of S. Rampart consists now of surface parking lots. The KCS originated in 1887, with the formation of the Kansas City Suburban Belt Railroad. Consolidations and bankruptcy created the Kansas City Southern Railroad on April 1, 1900. KCS is the smallest Class 1 railroad in the United States. It connects New Orleans and Kansas City. Therefore, size isn’t everything. Therefore, the area serviced is lucrative. EMD E3 locomotives powered the train. KCS painted the sleeper cars to match the newer equipment. Sleeper service ran only from Shreveport to New Orleans. This consist ran basically unchanged, from 1949 to 1968. Meal service in observation cars replaced diner cars in the mid-1960s. KCS dropped sleeper service in 1968. KCS put a “face” to their new train. They created “Miss Southern Belle”. The railroad chose 18-year old Margaret Landry for the job, at contest in New Orleans on August 24, 1940. She toured with the train for a few weeks. The train featured her photo as the drumhead. While the railroad publicly committed to its passenger trains, things changed in 1967. The US Postal Service cancelled mail transportation contracts with the railroads. Without that income stream, The railroad reconsidered service. KCS discontinued the Southern Belle two years later, in 1969. From 1918: New Orleans Railway and Light Company’s streetcar #025 running outbound on N. Rampart Street, on the Dauphine line. 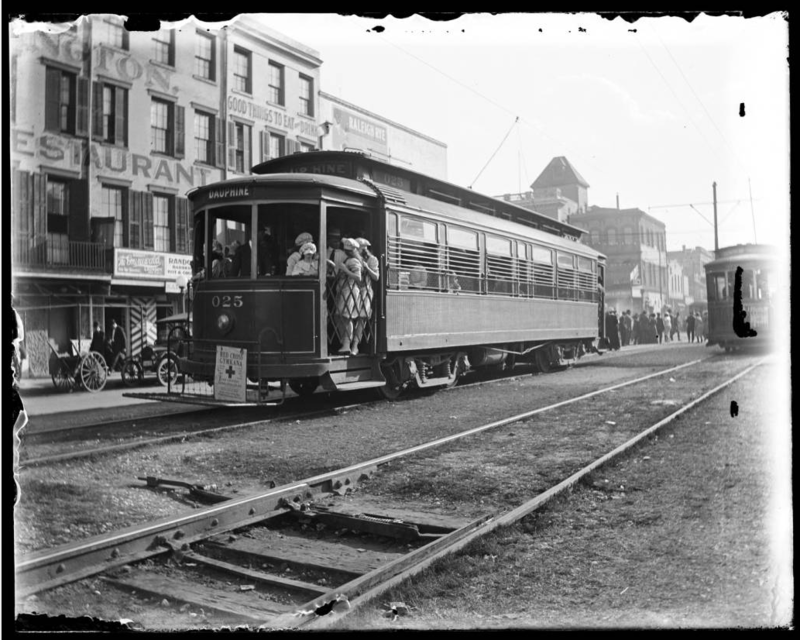 This is a “Palace” streetcar, from the American Car Company of St. Louis. To the right is a single-truck Ford, Bacon and Davis streetcar, heading inbound to Canal Street. NORwy&L 025 is passing The Arlington Restaurant in the 100 block of N. Rampart.